1. Is Finn interested in worms? 2. Who knows more information about worms - Finn or Feifei? Yes, the part with the fat little bump on it will survive. I knew that. It’s fascinating, isn’t it? And earthworms can be really short – from only one millimetre – to a massive three metres! Right. Well, 'a can of worms' is a phrase we use to describe a situation that causes a lot of problems when you start to deal with it. Yes, well anyway – I hope everyone listening understands the phrase now. I think I'll get back to my reading. 34,000 different kinds of worm, wow… They can live for up to 10 years! 2.Finn knows more information about worms. Careful! You'll open a whole can of worms if you try to make any suggestions about the way Peter works. He's done things the same way for years and making any changes will just cause more problems. I opened a can of worms when I asked my boss a simple question about the company's finances. He discovered that somebody has been lying about our expenses for months! Cindy only went to the dentist to have one of her teeth checked, but she's opened a can of worms. The dentist says she needs to fix two other teeth as well, and it will cost her a lot of money. Which is the correct definition of ‘a can of worms’? ትላትል የሞላበትን ጣሳ ብንከፍት፥ ምን ያህል ችግሮች ይከሰታሉ? 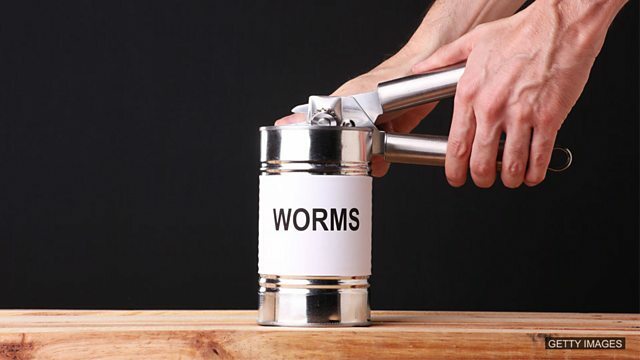 Have you ever opened ‘a can of worms’? What was the situation? What happened? Come and tell us on our Facebook group.